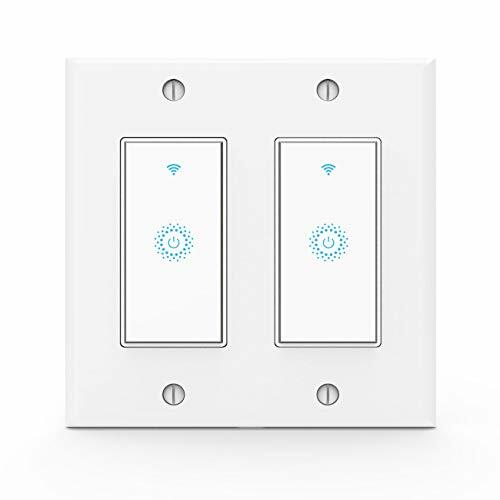 Start to get a smart switch,living in a joyful home. Make your every Light Bulb smart via the smart light switch. Create a group for lightings, control them all with one command. Set scenes to meet all your needs. Make every lighting thing just perfect for you. Take lights control to a whole new level. A1:It was caused by the firmware update.You need to upgrade the firmware to the latest version or you just need to remove the switch from App and re-add it back to the App. 1, A neutral wire required. 2, WiFi supports 2.4 GHz and 4G network.Does NOT support to 5 GHz network. 3, This is ONE-way switch only. Don't support 2 way or 3 way switch ,compatible with 118/120 type wall box. 4, WiFi name and password should only contain letters and numbers. No special symbols allowed. ETL and FCC approved for safety and quality. 1 Year Warranty and 100% Customer Satisfaction Service online.